This section is an eclectic range of unusual annuals, biennials, bulbs, climbers, exotics, ferns and trees. Small tree with dark green three lobed leaves and good autumn colour. Fast growing American maple with shiny deep green, silvery backed foliage which turns a good red in autumn. Red flowers and fruits on mature trees. Deciduous free flowering form of the strap leaved and large flowered agapanthus. Good in containers, easily over-wintered under glass. A bushy annual with brilliant red flowers. Best in sun and sheltered situation. Height to 50cm. Lovely small leaved begonia with masses of small orange flowers throughout summer. Can make impressive pot plant. Happy outdoors during summer but protect from harsh winds. A herbaceous bushy clematis which will ramble within the border. Small blue flowers. Easy, vigorous climber with yellow bell-like flowers followed by fluffy seedheads which persist throughout the winter. Prune in spring as necessary. Delicate climbing clematis with fragrant small purple-blue flowers during summer. Half-hardy perennial with vivid blue flowers, each lasting a day, borne in profusion all summer. Can survive mild winters or lift and store crown. Variegated dogwood with brilliant red stems and white-edged green leaves. Prune hard to maintain good stem colour. Making an attractive small tree this cornus will flower when mature and has brilliant red autumn colouring. Orange yellow bark on this fine stemmed cornus which can sucker. Bright green stems on this vigorous dogwood. Good for hedging and shelter. Vigorous, branching species Dahlia with single lavender coloured flowers. Makes good container plant and is then easily kept over winter in its container allowing the compost to dry out. A clump of grass-like foliage bearing long, arching flower stems with drooping bell-like flowers in various shades of pink. Demands dry soils and sun. Good in pots. Height to 1m. Charming daisy with white flowers, ageing pink, on long stems. Likes sun and poor soil in sheltered site. May well self seed. Can succumb to cold winters if in wet soil. Height and spread 20cm. An attractive small tree with downy young branches and silver leaves. Small fragrant flowers in summer. Best in a sunny sheltered position and free draining soil. Very aromatic and attractive hardy eucalyptus with young shoots coloured red. Will grow rapidly in sheltered sites. Can coppice to keep growth in check. Will do best on light well-drained soils. Evergreen silver-blue juvenile leaves on neat tree with peeling cream, pink and brown bark. Best coppiced to produce masses of silvery foliage on slender stems. Enjoys sun and well drained soil. Protect from severe weather when young. Red stems and large oval leaves. Protect from severe weather when young. Large flowered form of the pineapple plant with white or green flowers edged purple. Easily kept in a pot in a frost-free place over winter. Bold evergreen shrub with glossy deep green lobed leaves. Hardy but needs a sheltered site, tolerates sun best in shade. 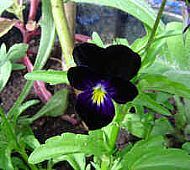 Happy in large container and can be sheltered in cold greenhouse over winter. Height and spread, dictated by container, can reach 2m plus. Fabulous shrub with glaucous grey fragrant leaves. Fast grower and frost hardy. Good in containers and can be over-wintered in cold greenhouse. Will regrow from roots if hit by frost. Unusual pale yellow bulbous iris, flowering in late spring. Clumps up and likes sunny and well-drained soils. Deciduous fern, very hardy, with handsome upright fronds and strong rhizomes producing new plants thus building up a colony. Needs damp soil and shade. Height to 1m. An architectural treasure - but big! Tall, branching, spiny biennial with silver-grey woolly leaves and deep purple-pink thistle flowers, loved by butterflies. May seed. Likes rich well drained soil, preferably in full sun. Height 2 m plus. Spread 1 m.
Polystichium setiferum divisilobum - Soft shield fern . Hardy perennial, with glossy, sometimes mealy, leaves and sprays of variously coloured primrose-like flowers in spring. 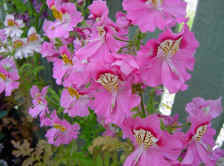 Can be grown in the border but best grown in pots and admired at closer quarters. Mealy leaved varieties best grown under cover as rain spoils leaves. Beautiful deep blue flowers borne freely on strong stems bearing soft oval green leaves. Not fully hardy but can be easily grown in a pot and over wintered in a cold greenhouse allowing compost to dry out. Bring into growth with sparing applications of water once shoots appear in spring. Likes sun and a sheltered spot where you can admire the flowers. Annual with architectural leaves. Very spiny, whitemarbled green leaves form an impressive rosette. Can self seed. Position with care. Sun and well-drained soil preferred. Height 1.2m, spread 60cm plus. A number of species tulips are offered at the nursery in pots during spring. These dainty small tulips can establish quickly to form large clumps. They enjoy a sunny site, well drained and sheltered from strong winds. Slender tulip with yellow and red-orange flowers. Height to 20cm. Red with green tinge, multi-flowered. Height to 20cm. Slender yellow flowers on strong stems, with red and olive colouring to the reverse. To 15cm. Slender tall annual with small purple-pink flowers attractive to bees and butterflies. Height to 1.2 m. Offered in trays of 6 plants.